The Green River Zen Center is a living mandala for the awakening of all, part of the timeless work towards liberation that began long before we arrived and will continue long after we’re no longer here. In a model of Shared Stewardship, personal differences are appreciated for what they are, doorways to different perceptions, dreams and talents. The Zendo is organized according to the Five Buddha Wisdom Families: Buddha, Karma, Padma, Ratna, and Vajra. We translate them as: Not-knowing, Social Action, Relationship and Arts, Resources, and Study. Each is a circle of life emphasizing its own wisdom but also incorporating the other four. Together they make sure that the needs of the sangha are served in balance and harmony. Each family has its own Steward or Co-Stewards to take care of the needs and issues related to that family. 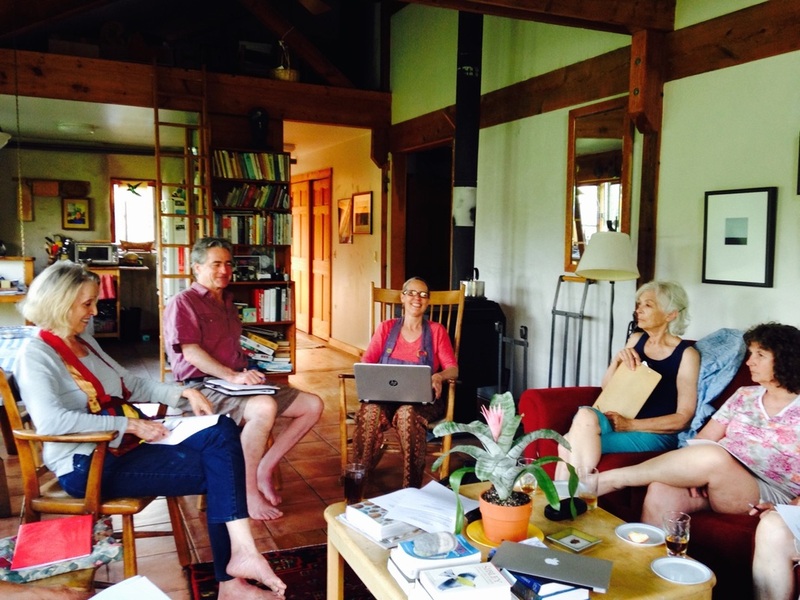 Shared Stewardship is a model for self-governance; it is also a practice to bear witness to the diversity of all our members and participants, and the one sangha that emerges. Like Kannon who has many hands and hears all the sounds of the universe, this model of self-governance trains Stewards and all Zendo members to hear as many sounds as possible, and then use our different skill sets and capabilities—our many arms—to take care of ourselves and the world. SHARED STEWARDSHIP MEETINGS ARE HELD EVERY THREE MONTHS. ALL GRZC SANGHA MEMBERS ARE WARMLY INVITED AND STRONGLY ENCOURAGED TO ATTEND THESE MEETINGS. At a meeting of the Stewards of Green River Zen Center on Monday, September 22, I introduced the topic of GRZC becoming a member group of the Zen Peacemaker Order. The stewards asked me to discuss this question with the general membership in this newsletter. The issue will be taken up for a vote at the stewards’ meeting scheduled for December 3, and we welcome everyone’s input. The Zen Peacemaker Order was originally created in 1996 by Roshis Bernie Glassman and Jishu Holmes, along with a group of Founding Teachers. While Zen Peacemakers has always been a loose confederation of individual practitioners, teachers, Zen centers and circles, the Order was more structured, with training paths and commitments that individual members had to make, including a Rule (the Zen Peacemaker Precepts). Founding teachers included Roshis Joan Halifax (Upaya), Egyoku Nakao (Zen Center of Los Angeles), Enkyo O’Hara (Village Zendo), Genro Gauntt (Hudson River Peacemaker Institute), and myself. Despite an auspicious beginning, the Order suffered a setback with the death of Jishu Holmes in 1998 and lay relatively dormant for a number of years despite active interest by its members. During this last year Roshis Bernie Glassman and Egyoku Nakao decided to revitalize it. This happened not just in response to inquiries by the Order’s existing members, but more important, in response to the challenges facing Zen practitioners in the West: What is this practice about for relatively prosperous Westerner? What does waking up mean in a world that feels increasingly unstable and violent? They began to clarify guidelines for governance and membership, convened working groups to finalize vision/ mission statements and values (in which I participated), and laid a foundation for renewing the order. They provided for individual members (of which I am one) and for group members. The criteria for becoming a group member are simple and can be found on the Zen Peacemakers website, http://zenpeacemakers.org/zpo-member-groups. They basically call for groups to include the Zen Peacemakers’ Three Tenets as a core practice and to encourage members to do social action. They also ask a member group to provide at least one training a year in the core practices of the Order, which comprise the Precepts, the Three Tenets, Council practice, the Gate of Sweet Nectar liturgy, and so on. There are no financial commitments. As I said at the stewards’ meeting, GRZC fulfills these criteria easily. We’ve done these trainings regularly, the Three Tenets are referred to in almost all our joint study, and some of us do social action. But I believe that the vision of the Zen Peacemakers Order warrants further consideration. GRZC is a self-sustaining, independent sangha, like most Zen sanghas in this country. We are a part of a teachers’ lineage that goes from me through Bernie Glassman through Taizan Maezumi and through many Soto Zen teachers in Japan, all of whom have certainly influenced us, but that says nothing about the bigger framework for the sangha as a whole. We’re not part of any association or group and don’t subscribe to a joint vision with any other sangha. That’s very different from most churches or synagogues, for example, that point to a bigger framework of which they’re a part (Unitarians, Catholics, Congregationalist, Reform Judaism, etc.). Being solitary in this way gives us our independence; it can also make us small and insular in vision. I joined the Order on an individual basis not only because it was founded by my husband or because I was a Founding Teacher. I joined it because it’s a movement for change on different levels—individual, societal, planetary. It asks us not to dwell on our own transformation, on our own peace of mind and happiness, but to use our practice to move that dial of universal awakening a fraction of a millimeter forward. It challenges us to ask what small, doable steps we can take, day after day, towards healing in this world, between genders, nations, religions and cultures, towards proper stewardship of our earth and its plants, towards a proper relationship with all beings. Sitting meditation is part of it; it’s not all. The Zen Peacemaker Order envisages sanghas working for the sake of all, doing ministries in prisons, areas of poverty (of which there are a number here in Franklin County), global warming, families in need, violence. If it doesn’t ask us to become hermits, it also doesn’t require us to stop living middle-class lives. Instead it challenges us to bear witness to the Other—whatever Other that is—and take some small action for my family, community and the world. The Order doesn’t supplant our own governance. It has grievance procedures which it asks member groups to adopt in case they don’t have their own, but GRZC has its own. There are no financial commitments. It simply beckons us to join a bigger movement, open our practice eyes wider, and start putting Zen on the map as a conglomeration of practitioners subscribing to similar values and ready to work together. For those of you who’ve studied the history of Zen in this country, you’ll see immediately that this is a big, big deal. So please, let’s join the Zen Center of Los Angeles, Village Zendo, the Center of Council, and others and become a member group of the Zen Peacemaker Order (you’ll find a list of member groups on the website). Please feel free to give any or all of the stewards (Chosui and Inzan, Karen Idoine, Sally, Shunryo, and myself) feedback on this question, or else come and take part in the next stewards meeting on the early evening of December 3.